Hornets History - Bert Who? At 5'6" and 144lbs, he was slightly below average size for a football player of his day. However, when Bertram Clark stepped onto the Hornets football field, he was far from average. Clark started in the Hornets backfield for four years from 1918 thru 1921, playing both Quarterback and Running Back. Clark was a threat from anywhere on the field, scoring by the run, the pass, special teams and even by the rare field goal. In a 1921 romp over Pattonsburg, Clark had five rushing touchdowns, three receiving touchdowns, one punt return touchdown and passed for one touchdown. "A native of Chillicothe, Clark was an all-conference and honorable mention all-America halfback in 1926. He holds special distinction, having scored all of his touchdowns in three consecutive upset victories over Nebraska- 9-6 in 1925, 14-7 in 1926, and 7-6 in 1927. He later spent 44 years as a coach, athletic director and college administrator at Principia College in Elsah, Ill., where the football stadium is named for him. His grandson, Tim, was an all-conference infielder on the Missouri baseball team in the mid-1980s. Clark, who was a gold medalist at the Senior Olympics in 1985, lived in St. Louis until his death in 2001." 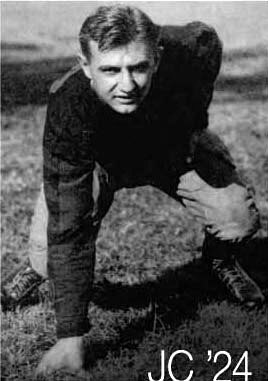 After graduation from Mizzou, Clark returned to Principia college where his 1933 football team went undefeated, untied and un-scored upon for the season. Clark was inducted into Principia's hall of fame in 2006.